This release includes several new features that extend ServiceTrade's salesperson tracking capability. 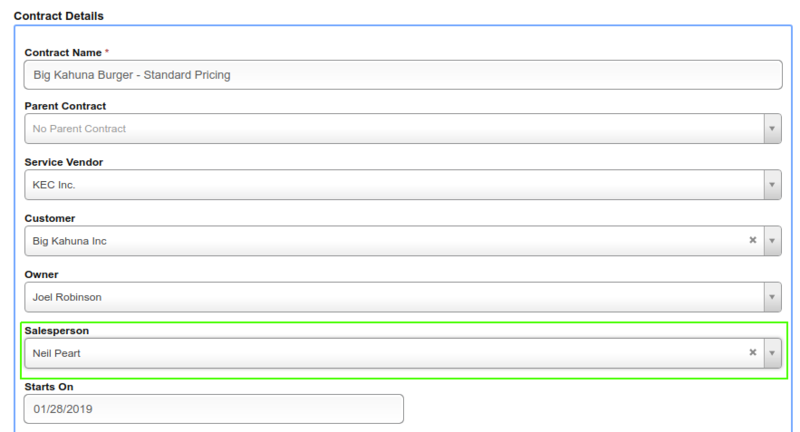 You can now assign a salesperson to each service contract that you create. You can use this assignment to indicate which salesperson sold a contract, which in turn helps you manage your sales efforts around renewing and upselling existing contracts. Users who have permission to edit salesperson assignments can indicate the salesperson on a contract when creating or editing that contract. The contract list can then be searched for contracts assigned to a given salesperson. Deficiencies can also have a salesperson assignment. Your organization can use this capability to route newly created deficiencies to the correct salesperson, simply by assigning those deficiencies from the deficiency list. As with contracts, the ability to assign salespeople on deficiencies is restricted to users who have permission to edit salesperson assignments. 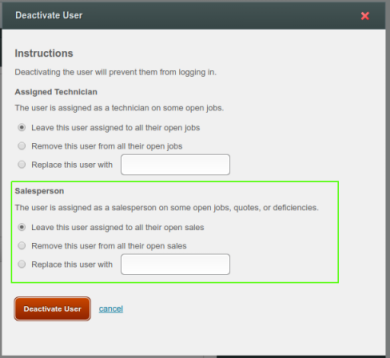 When you deactivate a user who is assigned as a salesperson on active jobs, quotes, or deficiencies, you can now choose whether to leave those assignments in place, replace that salesperson with another salesperson, or simply remove the assignments. In future releases the salesperson assignment capability will be extended even further: contract salesperson assignments will be used to auto-assign jobs, quotes, and deficiencies to the correct salesperson when they are created, and users can subscribe to email notifications about records for which they're the assigned salespeople.